Welcome to the fifty-ninth episode of the Tea in the Treetops podcast hosted by Philippa and Anni. In this episode, we discuss some film news, and we list some of our favourite reads for 2017. We’re giving books away to two lucky winners! We also review Nevermoor: The Trials of Morrigan Crow by Jessica Townsend. This review is spoiler-free, until it’s not. We do give fair warning before spoilers. This episode was recorded on 6 December 2017. We, quite simply, loved this book. Everything about it was delightful and very well put together. If you liked Harry Potter or the Magisterium series from Cassandra Clare and Holly Black, you’ll love this. Enter to win any of the books listed in this post, using the form below! Two winners will win a book of their choice, from Booktopia for Aussie winners, or Book Depository for everyone else. This giveaway is open internationally, as long as Book Depository ships to your country (go here to check). Nevermoor film to be produced by Twentieth Century Fox. The Wrath and the Dawn film rights acquired by Imagine. Unearthed film rights acquired by Colombia pictures, to be produced by Tyler Thompson. Graevale (Medoran Chronicles #4) by Lynette Noni – launch at Mt Alvernia College, Kedron, on January 25, 2018. Book here. I can’t believe I’m so slow writing this review, but in fairness, the book has now been read by 4 people in our home and I always come in last when it comes to that debate. Everything about this book drips with wonder. To say that Jessica Townsend is a once in a decade writer/storyteller is not too brave a comment. She writes her brave lead, Morigan, with grace and while she has a shadowy past, her desire to find hope is ever present. I know there have been a lot of comparisons to Potter here, but while I think that’s fair, I think that Nevermoor stands on its own, and no comparisons are needed. I hate spoilery reviews, but I will say this. 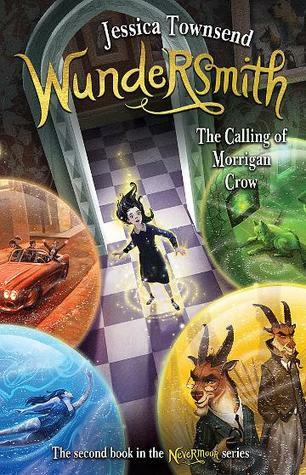 You’ll fall in love with Morigan Crow. If you’re an old duffer like me you will start planning your Jupiter cosplay before you finish the chapter when he is introduced (which is perhaps my favorite character introduction in a decade). And you’ll never look at an old hotel or an umbrella the same. Thanks Fola, such a glowing recommendation 🙂 I’m so glad you and your family enjoyed Nevermoor as much as we did.